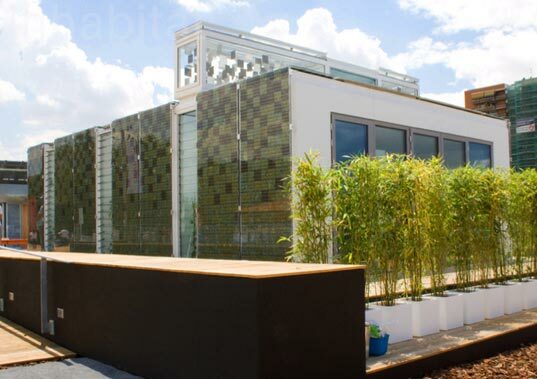 All of the homes in this year’s Solar Decathlon Europe utilize advanced building technologies and green strategies to optimize their energy use — this is especially evident in the home+ by Stuttgart University of Applied Sciences. The beautiful shimmering photovoltaic-covered exterior is actually far more complicated on the inside, providing highly energy efficient heating and cooling. An energy tower and phase-changing materials help the home easily move hot or cold air to where it is needed most, and of course the home can generate far more energy than it could ever need. The home is composed of four evenly-spaced modules that are joined together with air gaps with operable windows and doors that provide daylighting, pre-warm the air in the winter, and provide passive cooling through cross-ventilation in summer. The home’s entrance and deck leads into the living room, through the dining room and kitchen, and finally back to the bedroom and bathroom. Storage and side rooms are neatly positioned on either side of the main living areas. Between the dining and bedroom modules is a large energy tower, which helps move air, heating and cooling throughout the house. An active ventilation unit provides heat recovery, and phase-changing materials act as thermal mass to help store energy and move it efficiently. As Stuttgart’s home+ is completely covered on the roof and East and West facades with solar panels, the home is designed as an energy positive home and is expected to produce more energy than it needs. The facades are coated in bronze and gold photovoltaic cells, while the roof is covered in black mono-crystalline cells for an interesting contrast and a shimmering effect. As of Tuesday, Stuttgart University is in 8th place overall, although they did tie for 4th place in Architecture and 6th in Industrialization and Market Viability. The competition lasts through this weekend so the winner still has yet to be determined, and upcoming scores for Energy Balance and Sustainability may just tip the scales. All of the homes in this year's Solar Decathlon Europe utilize advanced building technologies and green strategies to optimize their energy use -- this is especially evident in the home+ by Stuttgart University of Applied Sciences. The beautiful shimmering photovoltaic-covered exterior is actually far more complicated on the inside, providing highly energy efficient heating and cooling. An energy tower and phase-changing materials help the home easily move hot or cold air to where it is needed most, and of course the home can generate far more energy than it could ever need.